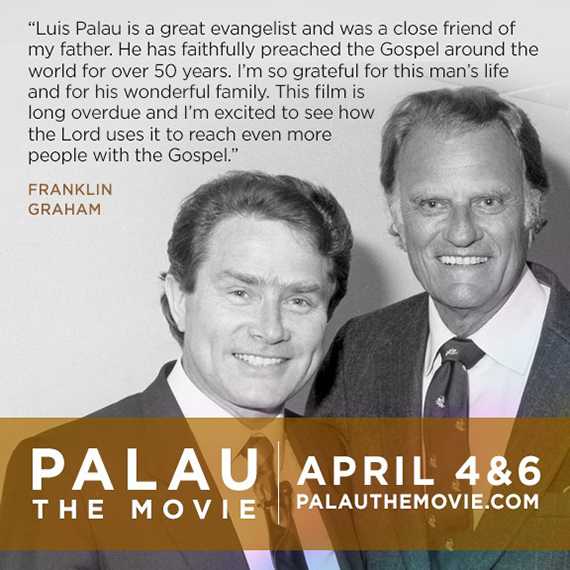 Palau the Movie, the feature film based on the life of evangelist Luis Palau, releases April 4 and 6 in theaters across the United States and Latin America. The film tells the true story of a man who was born in a small town in Argentina, committed his whole life to the works of the Lord, and embarked on an incredible journey to become one of the greatest evangelists in history. The legacy of Luis Palau and what God can do with a willing heart will inspire people of faith for generations. To view the trailer for Palau the Movie and to learn more about the film, visit www.PalauTheMovie.com and Facebook.com/PalauMovie. To find a theater near you and purchase tickets, visit www.palauthemovie.com/tickets. For group ticket purchases or to bring the film to your church, visit www.palauthemovie.com/group-sales. All proceeds will be given to Luis Palau Association to further their global ministry.